What do Adam Levine, Adam Sandler, Alyssa Milano, Anthony Bourdain, Anthony Kiedis, Ben Affleck, Cameron Diaz, Demi Moore, George Clooney, James Cameron, Jay Leno, Jay-Z, Leonardo DiCaprio, Matt Damon, Morgan Freeman, Steve Wozniak, Steven Spielberg, and Will Smith have in common? They all drive electric vehicles. Volvo might not be the first brand that comes to mind when considering an electric car, the megastars and business leaders above being Tesla Model S and Model X SUV owners, but the much more established Swedish automaker wants to change that perception by next decade. Volvo, which sold 503,127 cars globally in 2015, an all-time record and the first year the premium brand has bypassed the half-million-unit mark in its 89-year history, claims it will have produced a cumulative 1 million electrified vehicles before 2025 is finished. This will include both hybrid electric models and full plug-in EVs, that all-electric model expected to arrive in 2019. "It is going to be a challenge," said the brand's CEO, Håkan Samuelsson, "but Volvo wants to be at the forefront of this shift to electrification." Of note, it took every auto producer currently building plug-in electric vehicles to reach the 1-million mark as of September 2015, 33 percent of which were sold in the U.S. This said most of these EVs have been sold in the last two years alone, with more than 500,000 delivered after July of 2014. These sound like a big numbers until factoring in total global vehicle sales of 88.7 million units in 2015, which incidentally represented a 2.0-percent jump from the year prior, but nevertheless the shift to electrified vehicles will undoubtedly ramp up as governments around the world incentivize their sales and simultaneously penalize automakers that don't meet ever-more-stringent fuel economy targets. Volvo's transition to electric power will be underpinned by two new platform architectures, including one that's scalable and another that's modular. Both the Scalable Power Architecture (SPA) and the Compact Modular Architecture (CMA) will be able to support hybrid and full-electric powertrains, with SPA being used for Volvo's larger 60, 70 and 90 series models and CMA for its smaller 40 series cars. 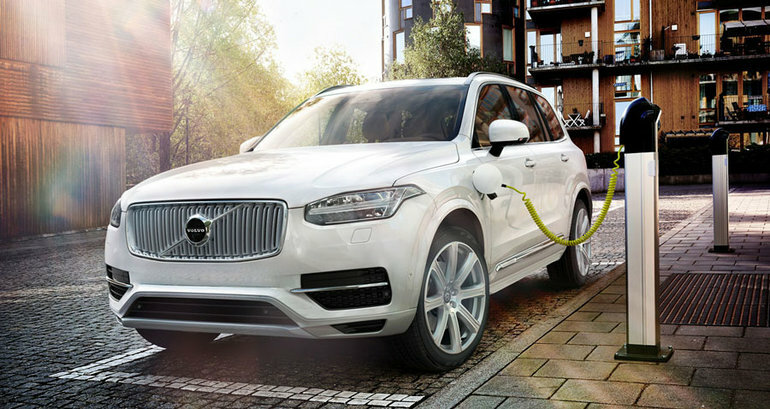 So far the only electrified Volvo available is the all-new 2016 XC90 T8 Twin Engine mid-size crossover SUV that incorporates the brand's new 316 horsepower direct-injected, turbocharged and supercharged 2.0-litre four-cylinder engine along with an 87 horsepower electric motor, 9.2-kWh lithium-ion battery and plug-in charge system, resulting in 400 net horsepower and 427 lb-ft of torque driving all four wheels and an estimated 9.8 L/100km combined city/highway fuel economy rating (the U.S. EPA gives it a more realistic 59-MPGe combined rating, which converts into 4.0 L/100km). With fuel economy and performance like that, plus a price that starts at just $74,150 plus freight and dealer fees, it shouldn't be too difficult to coax more luxury buyers into plug-in electric vehicles.